We all know that learning to speak a foreign language is difficult. But with effort and time, it is possible. And you don’t have to pay a fortune for hundreds of lessons either. I speak Spanish fluently and I paid for less than a dozen lessons. This is how I did it. The Pimsular method works on the principle that our brains anticipate the correct response in a conversation, whether you’re speaking English or another language. During the audio the learner hears a sentence, there is then a pause for the learner to respond. The audio then give you the correct answer, reinforcing the correct grammar. Pimsular will take you up to an intermediate level, meaning by the end of its five courses you’ll be able to communicate in a social situation, ask a variety of questions, express future plans and talk about past experiences. It is truly the best way to start communicating in Spanish. Now with some Spanish in your head, you’re probably itching to learn more. But before you hit the books or podcasts, I strongly advise you to learn the 300 highest frequency words in the language. The reason for this is simple: high frequency words appear in every sentence. If you’re familiar with them then you’ll be able to work out more or less what someone is saying. In the beginning, you don’t need all the verb tenses or to know pronoun rules. You just need to know enough to be able to track, more or less, what someone is saying and to say something yourself. As you practice, you will naturally develop a deeper knowledge of the grammar through experience. This is exactly the method that linguist Dr Stephen Krashen talks about on how to learn to speak a new language. Pimsular will have taught you many of these basic words, but to learn more use an app to learn Spanish like Memrize to help you memorise those small, high frequency words. This is probably the hardest task. Spanish verbs have lots of conjugations and it took me several years to be able to use all the tenses correctly. For this I recommend listening to lots of podcasts (a list of which you can find below) to acquire new Spanish words and reinforce what you know. I then recommend strengthening your knowledge further with some really good grammar books. 1# Tell you what each language point is in English so that you can connect it back to your mother tongue. 2# Provide plenty of real world-examples of the language point in use. 3# Provide written practice at the end of each chapter. The essential Spanish grammar book, covering all tenses with explanations for each one in English. Every chapter also includes written exercise so you can check your understanding. Spanish pronouns can be difficult and so it is worth buying this extra book. It covers how to use those tricky direct and indirect pronouns as well as which verbs are followed by a certain preposition or even no preposition at all. This is very useful for English speakers, as the two languages do not always use the same preposition. If you’ve been learning Spanish for a while, this is a great book to review your grammar. It covers all verb tenses, prepositions, question words and more. Each chapter ends with exercises so that you can check your understanding. It’s compact design means it is much more portable than the average Spanish textbook. 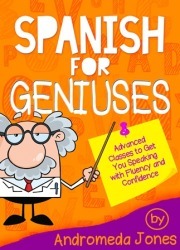 Written by your author, Spanish for Geniuses tackles the common language learner problem of, despite learning lots of grammar and vocabulary, you still lack the knowledge to have a normal conversation. The reason why you’re having this problem is that conversations are made from phrases and not words. I used to have this problem too, until I lived in Spain long enough to collect together all the phrases I needed to say everything I was used to saying in English. I then wrote them down and published them in a book to help other language learners, like you. 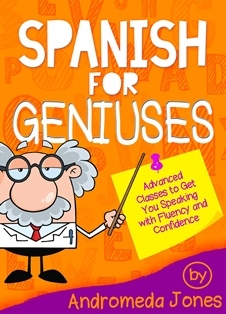 Spanish for Geniuses provides you with the tools to say everything you are used to saying in English with thousands of phrases divided by conversation category. This site provides bite-sized grammar and vocabulary lessons provided into units. Great for beginners, The Spanish Experiment provides phrases in Spanish and English with an audio so that you can check your pronunciation. It’s important to note that you shouldn’t spend all your time studying grammar. You should 20% of your time studying the theory of Spanish grammar and 80% absorbing the language through real world listening, speaking and reading exercises. 1# Memorising verb tables is very difficult. You’ll get bored and demotivated if that’s all you do. 2# Language comes from people, not grammar books. To really get a sense of how to speak it, you must listen to the conversations of real people. Once you start to understand conversations, you’ll discover that Spanish is easier than it seems. Not everyone uses all verb tenses. People play with language to express things in the simplest possible way and there is lots of repetition. 3# The journey of learning a language is long. To achieve the results you want, you must immerse yourself in Spanish-speaking culture, films, music and food. It’s your love of your new adopted culture which will spur you on to learn the language completely. So where do you go on the web to immerse yourself in Spanish? Thankfully, there are plenty of resources. Yabla is a paid resource, but it is well worth the money. It provides clips of thousands of different videos for your to learn Spanish in a real-life content. Videos include documentaries, to interviews to soap operas and music videos. You have the option to watch the videos with an English translation (I don’t recommend this), or with or without Spanish subtitles. Next, test your knowledge with a quiz. This is a great site to practice your comprehension and pronunciation. I learned a lot of vocabulary from this site and strengthened my knowledge of grammar by listening to real Spanish speakers. It was also a great insight into Spanish-speaking culture; the TV people watch and a taste of the latest music from South America and Spain. There are also free resources on YouTube where you can watch and listen real Spanish conversations. While fun (and useful) The downside to all these resources, however, is that there is no transcript to check your understanding. This site provides short street interviews with Spanish locals. The great thing about these videos is that they are subtitles in English and Spanish. This channel teaches you Spanish through a telenovela (soap opera) especially written to help students learn Spanish. The channel will teach you a lot of idiomatic expressions used in everyday conversation as well as broaden your knowledge of vocabulary. This YouTube channel provides short grammar and vocabulary classes to help you improve your grammatical knowledge of Spanish. This podcast provides short, simple podcasts to learn the basic aspects of Spanish. It also offers more complicated 25 minute podcasts for intermediate to advanced learners. Notes in Spanish provide real conversations between native Spanish speakers and Spanish aficionado Ben Curtis. They offer 15 minute conversations for intermediate to advanced level students. Internet language exchanges are an obvious place to start. As an English-speaker, you’ll be in demand. To get the best speaking partner, you need to complete your side of the bargain and correct your partner as needed. You should also learn a little about how English works so you can explain why something is incorrect and not just that it is wrong. If you’re interested to learn more about your native tongue, we publish a top-rated English grammar book that will explain to you how every grammar point in the English language works. You’re not learning Spanish to stay in your own country. Go out there and book a holiday to a Spanish speaking country and participate in some language exchanges. You won’t find a language exchange at a typical beach destination but if you book a city-break to a large city like Madrid, Barcelona or Valencia, you’ll find hundreds of language exchange nights across the city. Use the app Meet up, find these groups. This is normally the final goal. Because Spanish is a phonetic language, you’ll find spelling easy compared to non-phonetic languages such as French and English. A good way to practice writing is to find a Spanish speaking penfriend who wants to learn English. Another more direct way to do this is Lang-8. Lang-8 is a community where others will correct your writing in the language you are learning but in return you should correct someone else’s, who is learning your language. It’s free. A dictionary app on your phone is a must-have to check the pronunciation and usage of a word. Here are the two I use the most. This is a great tool. Here you’ll learn verb conjugations, how to pronounce a word with an audio and sentence examples. If you want to know what an expression or idiom is in Spanish or if you’ve seen something that you don’t understand, you’ll probably find the answer on Word Reference. Word Reference is a great language resource because all of the translations are given by people (and not machines) meaning that you can really understand the nuances of the expression. Learning a new language is a long, but rewarding, process. Along the way you must never lose sight of the reason why you started this project in the first place – to communicate with new people, make friends or deepen your existing relationships. Spanish is not a bunch of verb tables: It’s conversations, novels, songs, films and more spoken and made by 437 million people. Immerse yourself in that world and you’ll never forget the benefit of learning this beautiful language. Thanks for reading and the best of luck to you.